Ernie was an outstanding sprinter/long jumper for Conrad High School. In 1963, he set two Blue Hen Conference records, one in the long jump (22’3/4”) and the other in the 220yd. dash (:21.8). He finished the track and field season that year winning the title of County Champion for the long jump (20’9”). At Delaware State University, Ernie continued to use his athletic ability on the football field and also in track and field as a sprinter and long jumper. In 1967, he was the N.A.I.A. District 3 Champion in three events: 100yd. dash, 220yd. dash, and the long jump. 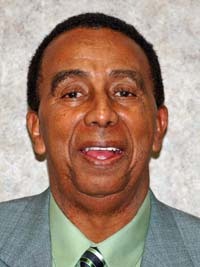 Ernie holds the distinction of being Delcastle Technical High School’s first track coach. He coached for 38 years, developing a track and field program which has brought great pride to the school and much success to his athletes. During his tenure, his boys and girls combined track teams won 16 Blue Hen Conference titles, 8 County titles, and 12 Indoor and Outdoor State titles. The dual meet records for his track teams total 283 wins-128 losses-4 ties and 12 undefeated seasons. All-State recognition has been earned by 140 of Ernie’s athletes, 12 who were state record holders of which 3 still hold the state record. Ernie is the recipient of 4 New Castle County Coach of the Year awards and 7 State Coach of the Year awards. He is a member of the Delaware State University Hall of Fame Class of 1989. Knowing that many of his athletes have received college scholarships, graduated, and are confident, successful men and women bring Coach Anderson great joy.